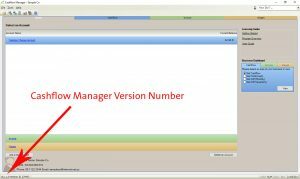 How to find your Cashflow Manager product version number. In all versions of Cashflow Manager for the PC, from version 7 upwards, the version number is printed in the bottom left hand corner of any screen in the program. To find your version number in these versions, simply run your Cashflow Manager program and load a business or sample file. When your file has loaded, look at the number in the bottom left-hand corner of the screen. This is your version number.